UPDATED: Thu., Nov. 9, 2017, 7:42 a.m. The only incumbent to safely hold her seat on the Spokane Valley City Council this past week said it’s clear why three of her co-council members were ousted from their posts. 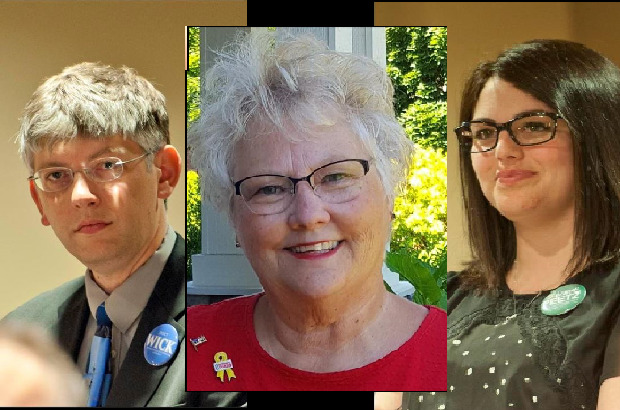 The Spokane Valley City Council typically leans conservative, so the addition of Brandi Peetz, Linda Hatcher Thompson and Ben Wick may shift the council’s dynamic, she said. On Tuesday, Pace told The Spokesman-Review that the election results surprised him, and that he thought they indicated a trend towards more liberal and Democratic values in the Valley. Neither of the other two unseated members returned requests for comment Wednesday. Haley ran strong throughout the Valley, winning several precincts by more than 50 votes over challenger Angie Beem. The three incumbents, Munch, Collier and Pace, lacked voter support throughout the Valley – particularly in Opportunity, according to voter race maps generated by The Spokesman-Review. However, Munch and Collier had a slight edge with voters in Trentwood. Mayor Rod Higgins, ahead as of Wednesday night, gained several votes in precincts farther west around Orchard Park but lost Opportunity and Dishman to challenger Chris Jackson. Spokane Valley Councilman Arne Woodard said the election results weren’t surprising, and citizens voiced their opinion by vote. Former City Council member Bill Gothmann said there are two factions within the Spokane Valley’s conservative party. One faction is pushing an ultraconservative agenda, he said, based on issues like splitting Washington state in two and declaring Spokane Valley as a Second Amendment sanctuary city. The other sector is interested in fundamental issues that reflect both the power and scope of what City Council should be doing, which includes maintaining city streets and taking care of law enforcement, Gothmann said. Former Spokane Valley Mayor Dean Grafos, who resigned last year amid the termination of City Manager Mike Jackson, said there were a couple of factors at play in the public’s decision to elect Peetz, Thompson and Wick. Grafos said he was elated with the election results and hopes challenger Chris Jackson prevails against Higgins in a race that is still too close to call. “I hope citizens understand we need to get back to the business of government taking care of the nuts and bolts of running a city and not getting into fringe issues and turning this into a political arena,” he said. Mike DeVleming, Spokane Valley’s first mayor since incorporation in 2003, said it’s difficult to predict how previous City Council issues will rank in priority with new council members. Former Sen. Jeff Baxter, R-Spokane Valley, said he doesn’t think the shift in City Council constitutes a shift toward more liberal voters. The candidates who were elected by and large are more conservative in their social and financial outlook, and several have business experience, Baxter said. Gothmann said it’s a pleasant surprise to have three women on the council. DeVleming said he’s pleased with the election results. Woodard said City Council is prepared to do what’s right for the public while focusing on public safety, infrastructure and economic development, rather than concerning itself with issues the city doesn’t have jurisdiction over. Woodard said the public rewards those who stay stable, consistent and open to comment. “They reward you for that because they know you are open-minded and trying to find the best information possible,” he said. Published: Nov. 9, 2017, midnight Updated: Nov. 9, 2017, 7:42 a.m.